It is time for another hoedown! 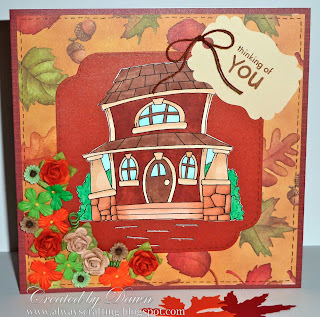 This week's hoedown is to use the house digi and add something from your home you wouldn't ordinarily add to a card. For my household item, I added staples... for the little stones leading up to the front porch of the house. It is not an item I would normal put on a card. I went a little crazy with the flowers on this card but this time of the year is so fun with all the pretty fall colors. Take care. Who'd have thought staples could be little stepping stones?! What a GREAT idea! :) I hear you on the flower thing. I never know when to stop...LOL! Another gorgeous card Dawn, I just love the beautiful Autumn colours you are using at the moment.